The Book of Circles is a collection of maxims for the swordsman. Written in 1E 780 by the legendary Redguard Swordsman Frandar Hunding, The Book of Circles is filled with wisdom regarding the art of combat and the forging of might blades. The Book of Circles would eventually become the tome that the renowned Sword Singers of Hammerfell would live by. The book is highly regarded in Redguard (Yokudan) culture and many of those warriors invested in the "Old Ways" are known to carry a copy and refer to it's proverbs daily. The mod is intended to promote immersion and role play for the mighty warriors of Skyrim and was made for The 5 Fables story on YouTube. As such I have tried to make the book as beautiful to look at as I could and my hope is that this will inspire the player to crack its cover regularly and take in the wisdom of Hunding. This mod places two version of the book in game. 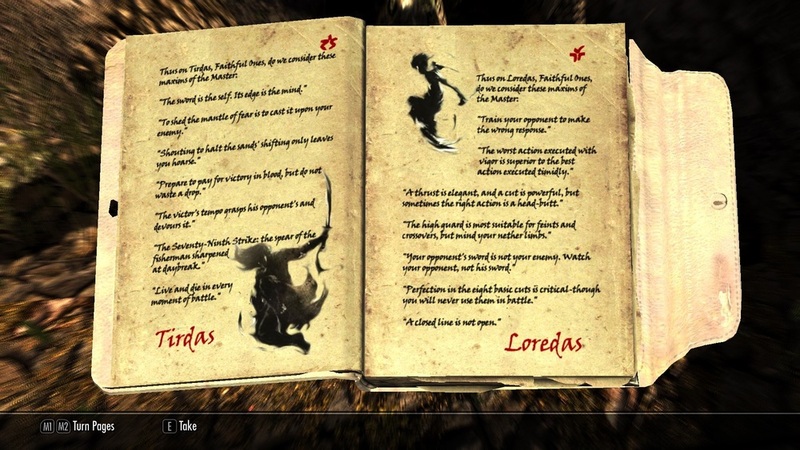 One standard book can be found in Jorrvaskr the other, a travelers journal, can be found in Bloated Man's Grotto. Each book awards a skill point in Smithing as a large portion of the book deals with forging of weapons. I recommend using a mod manager for installation. This mod includes a custom mesh, texture and .esp file. The beauty of this book was made possible by the talented Jung Shan. Check out more of her amazing watercolorson her site!